Nevada Solar Power Business Struggles To Keep The Lights On Since Nevada regulators began phasing out incentives, the solar power business has been in turmoil and many workers have been laid off. Now some worry what happened there will spread to other states. 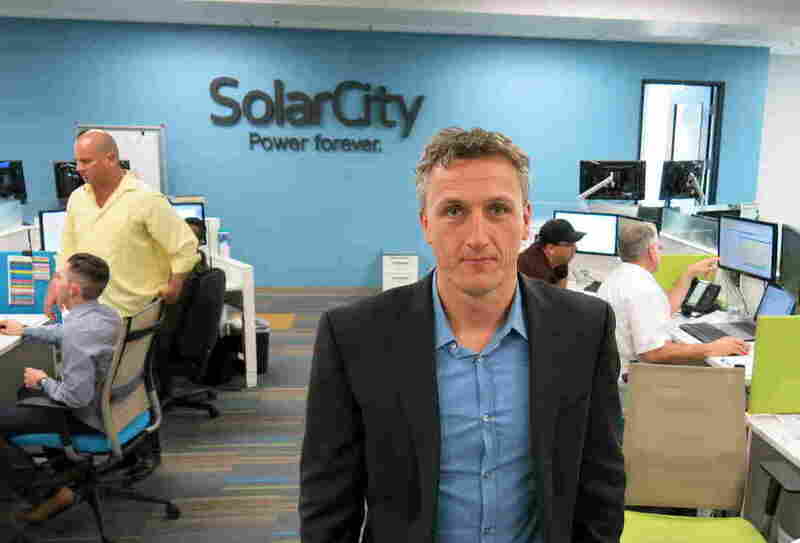 Lyndon Rive is co-founder and CEO of SolarCity. His company has stopped looking for business in Nevada since regulators started phasing out incentives. Nevada's home solar business is in turmoil as the state's Public Utilities Commission starts to phase out incentives for homeowners who install rooftop solar panels. Some of the largest solar companies have stopped seeking new business in the state and laid off hundreds of workers. Even for small solar installers, this once-booming business has slowed to a trickle. The warehouse at Robco Electric in Las Vegas was filled to capacity with pallets of solar panels stacked high last year. Now, it's nearly empty. "The PUC made a decision and it just devastated our industry," says Robco President Rob Kowalczik. He's all business when talking about how the PUC sided with the utility and pretty much killed off residential solar in Nevada. But when it comes to his workers, he chokes up. "The hardest thing is to lay people off," says Kowalczik. So far, his company has let 25 people go. The solar division of his company is down to a few salespeople and one installation crew. Connie Berry was a solar installer at Robco Electric but was laid off after the company's sales sharply dropped. One of the 25 is Connie Berry. She was just a few months into her job as an installer for Robco. Now, she's looking for work in the construction business, but she holds out hope her solar job will come back. "It's been two months now since I got laid off, and I was hoping to get a call back. ... I got my tools. I'm ready to go," says Berry. In front of Robco Electric, you're more likely now to see the company's sales cars parked in the middle of the day. Sales and marketing manager Tim Webb says last year they would have been out chasing down new leads all day. He says there were a lot of other solar companies on the road, too. "It was kind of like the solar gold rush here. All these companies flocked into town, set up an office and sold systems. Now they're gone. There's just a few of us remaining," says Webb. Companies like SolarCity say they were left with no choice but to stop doing business in Nevada when the PUC changed the rules for something called "net metering." 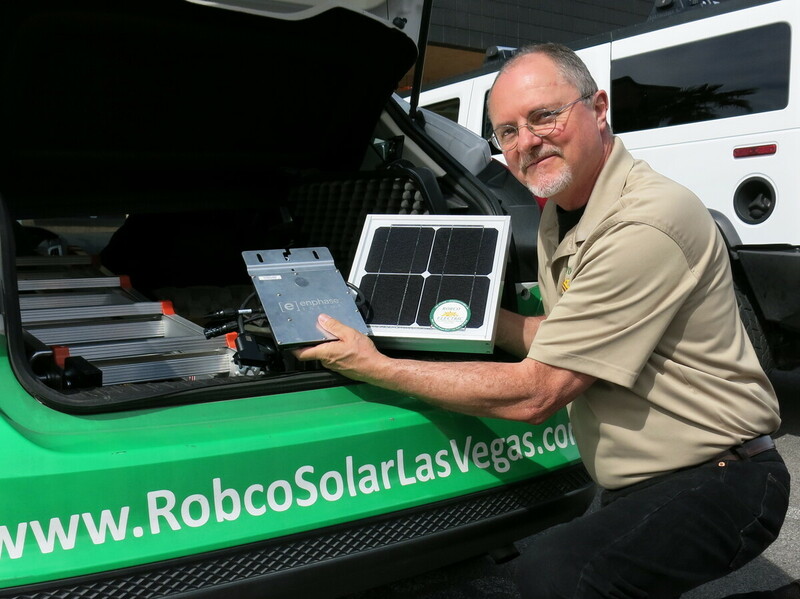 Robco Electric Sales and Marketing Manager Tim Webb shows off a solar panel from his sales kit. Since regulators have phased out solar incentives, his car often sits in the company parking lot. Net metering allows homeowners with solar panels to sell excess electricity they generate to the utility at retail rather than wholesale rates. It's a great deal for homeowners because they can do something good for the environment and save money on their energy bills. But every kilowatt generated on someone's roof is one less the local utility sells. And utilities use that ratepayer money to maintain the electrical grid. In this case, the local utility, NV Energy, is owned by Warren Buffett's company Berkshire Hathaway. During an interview with CNBC last month, Buffett echoed an argument utilities across the country have been making: When solar customers don't pay to maintain the power grid, that leaves everyone else to pick up the tab. "We do not want the nonsolar customers, of whom there are over a million, to be subsidizing the 17,000 solar customers," Buffett said, talking about NV Energy's customers in Nevada. Buffett said NV Energy can produce solar power from large, centralized plants for less than it costs to buy electricity from rooftop solar customers under the old net metering rules. "We do not want our million plus customers who do not have solar to be buying solar at 10.5 cents [per kilowatt hour] when we can churn it out for them at 4.5 cents," he said. SolarCity co-founder and CEO Lyndon Rive says utilities like NV Energy are just trying to protect their monopolies. "They want to deploy the infrastructure. They do not want to let consumers deploy that infrastructure because then they don't get a regulated rate of return on that infrastructure," says Rive. Rive wants big changes for the country's power grid. Instead of central generators delivering electricity out to customers, he imagines a grid where customers produce their own power and compete with the local utility. Under Rive's vision for the grid, there's a smaller role — and less profit — for utilities. "We need them to manage the lines and let the rest be a competitive market. Competition will drive innovation, which will then create products that we couldn't even think of today," he argues. The big solar companies haven't given up completely on Nevada yet. SolarCity and others plan to challenge the changes to net metering, first in the courts and then with a ballot referendum in November. 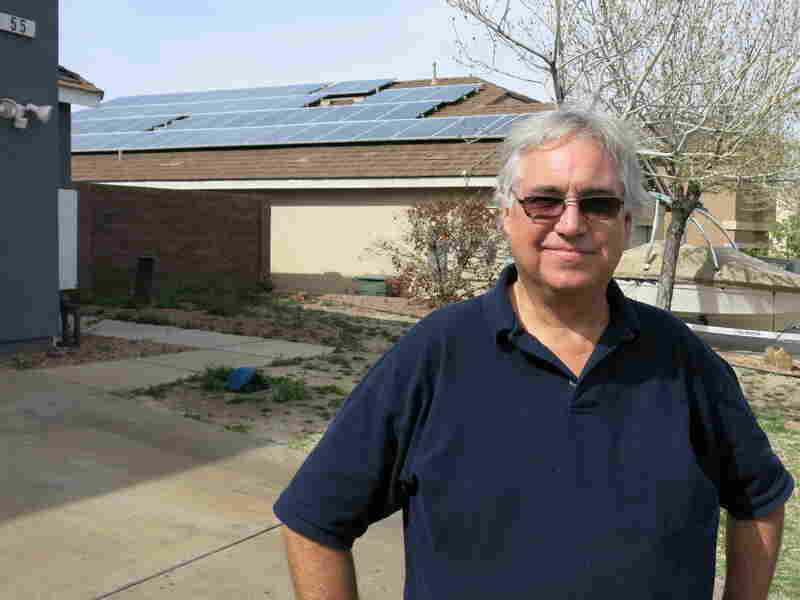 Dale Collier refinanced his house to install solar panels in 2011. He thought it would save him money long-term, but now says that without state solar incentives it was a bad decision. 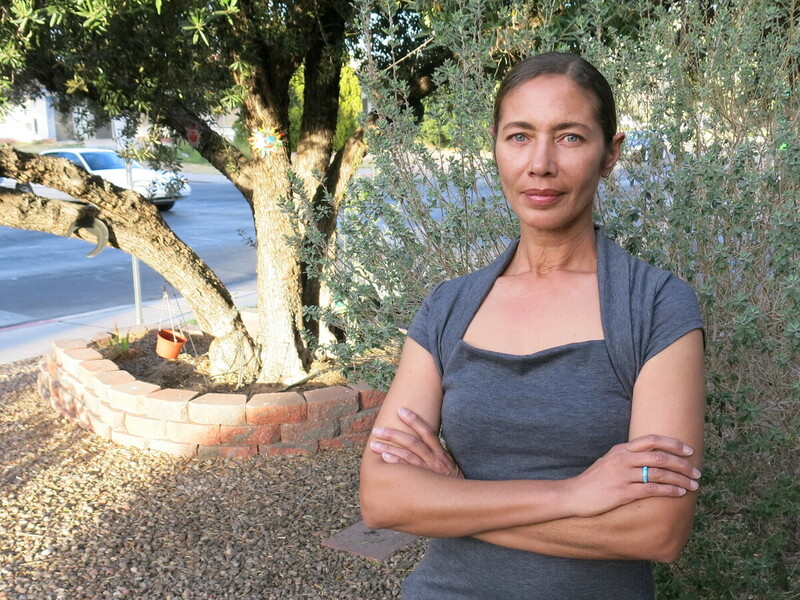 In the meantime, solar customers like Dale Collier are the big losers. His home in Henderson, outside Las Vegas, has 56 solar panels on the roof. He refinanced his house to pay for them. "I thought this was [one of] the smartest things I ever did; now I think it might be one of the stupidest things I ever did," says Collier. Up until the changes to net metering in Nevada, he was saving about $150 a month on his power bill. But once the incentives are phased out, he figures having solar panels will cost him money. NV Energy asked regulators to grandfather in people like Collier. But the PUC rejected that request, saying all solar customers — new and existing — should get the same deal. The question now is whether Nevada's experience will spread to other states. Solar advocates successfully preserved incentives next door in California. Now they're focused on another sunny state, Arizona, where the next battle over residential solar incentives appears to be heating up.